At a party recently, a bunch of old guys – artists, tinkerers and generally handy dudes of a certain age – were reminiscing about high school shop class. They found it amazing that forty and fifty years ago it was not considered unusual for a bunch of silly-assed, overly amped kids to be dealing with hands-on fooling around using massive, old, industrial-strength power tools. In fact, they agreed, shop class was the go-to class for all the worker-dude guys who were not academically inclined. All those assorted spinning wheels, sharp cutting edges, power cords, burning and smoking things, flying sparks, mounds of debris and such were a natural part of the shop class landscape. Every one of the guys remembered that their shop teacher was missing at least a couple of fingers. Every one of them remembered the safety lectures. Mostly, though, they remembered how shop class got them fascinated with the joy of Making Something. Collectively they mourned the passing of this rite of passage. Those old dudes were sounding “Taps” too early, it seems. The joy of Making has taken the world by storm again. It’s even got its own Movement now. Do-It-Yourself lives! 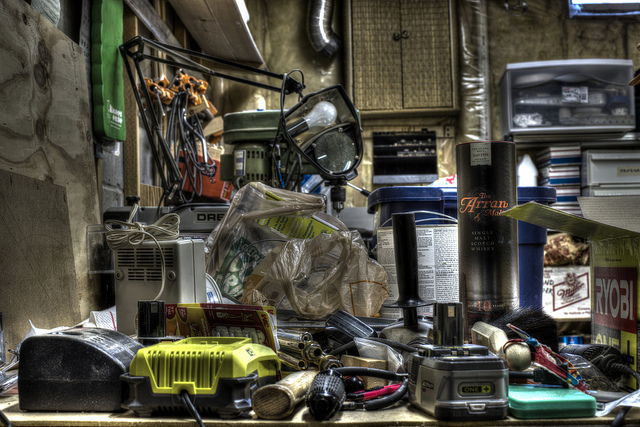 This “Maker Movement” is a convergence of traditional artisans, computer hackers, independent inventors, designers, tinkerers and other (often manic) crafty sorts who toil away in their cluttered workrooms and closet-offices making cool stuff that sometimes solve everyday problems, big and small, and sometimes is just for fun. The first stirrings of the Movement in 2005 was spurred on by the vision and enthusiasm of the editors of Make: magazine, a publication that was born out of founder Dale Dougherty’s conviction that Making is a very good thing to do. “I think the magic of [the magazine] was simply that we connected a lot of different groups that were making things but saw themselves as doing something separate,” Dougherty has said. According to him, the artisans and artists saw themselves as different than the people who do robotics or electronics. There was a sense of disconnection among all of these creative folks. A knitter, a musician and a guy who builds a drone might not be able to feel like they belong to the same tribe, for example. “To some degree calling them all makers kind of allowed for a flourishing of some different people coming together and seeing commonalities,” he said. 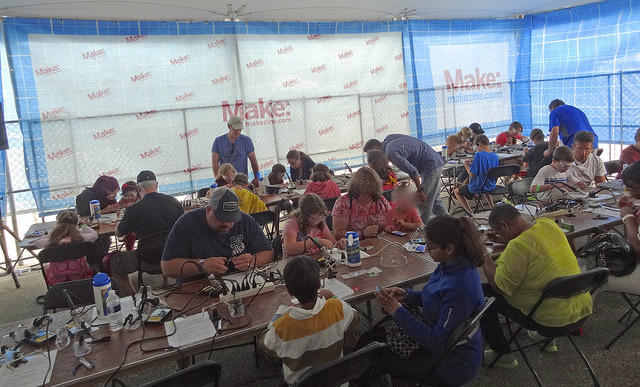 The Makers also spurred the magazine editors on to put together the first Maker Faire, a festival celebrating the innovation and self-reliance of the folks who do-it-yourself. The idea was to get all kinds of people of all ages and backgrounds to come together and show what they were making and share what they were learning with other people. It was also all about experimenting, playing, and having fun connecting with other people. The first Faire was a grand success, stirring the imaginations of jaded consumers numbed by the overabundance of generic, mass-produced goods. It spawned what has since became a worldwide network of fancy flagship Faires in major cities that involve thousands of people as well as more down-home, independently produced mini-faires. 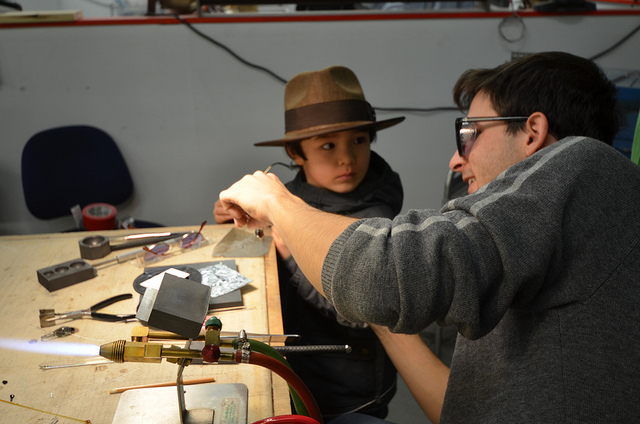 At these events, curious participants of all ages can experience the inventions of the Makers firsthand. The spectators are invited to join in the parade and fun is had by all. This 2012 YouTube video, “Inspiring a Maker Movement” was published by CNN and features Dale Dougherty talking about the very fundamental human need to make stuff. You’ll also get a taste of what it’s like to be at a Maker Faire. As Dougherty points out, it isn’t all high-tech, although 3D printers, digital manufacturing, drones and robots are all glittery highlights at the big international Faires. New forms of arts, entertainment, crafts, food experiments, and every other kind of human creativity is fodder for exploration. You can learn to build your own smartphone or make your own toys. You might be able to print out a pair of shoes. Maybe you’ll make your own jewelry or a handbag for mom or learn how to cook up something new. You might learn how to crochet. You might even learn how to home-automate your house with just a few simple measures. You could learn how to pickle, can, and preserve fruits and vegetables and check out the latest advances in bee-keeping, composting and growing your own food. You might learn how to write better instructions. Checking out all that’s new in the world of making things could lead you to the start of a new interest, hobby or vocation. At the Faires, open-source learning, contemporary design and powerful personal technology rule. The strategy is to provide interested people with the right tools and the inspiration and opportunity to use them. 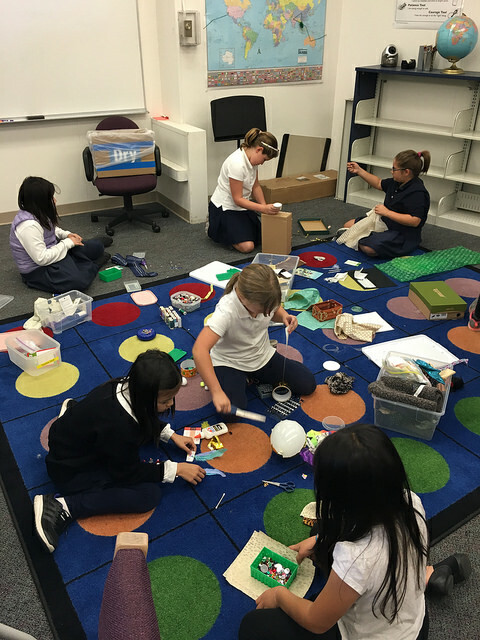 Creativity and a lot of imagination-sparking ensues. to check out the Faire schedules and locations. It truly is mind-boggling! Makers make stuff. They want to know how they can do this thing or that. They want to know how other people have solved a problem they are facing. Magazines (like Make: magazine) as well as books, podcasts and YouTube videos for do-it-yourselfers have grown exponentially as more and more people become interested in being a Maker of one sort or another. Hobbyists, enthusiasts, and those who’ve gained a certain mastery in some form of Making might be encouraged to give demonstrations, classes or workshops that attract others who want to explore new ways of Making too. 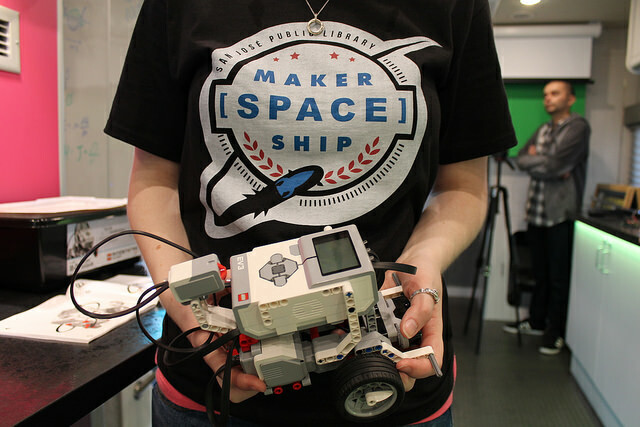 Then there are the MakerSpaces that welcome a diverse group of builders, hackers, and hobbyists who share resources and knowledge. Hundreds have cropped up in the past decade or so in the United States. Some are housed in existing community centers such as libraries, museums or youth centers. Others are sponsored by companies and organizations at conference centers. All of them focus on the love of Making. MakerSpaces have taken off in all kinds of directions. There are community-based spaces, spaces for kids, and spaces for explorers of all kinds. Here’s another YouTube video, by Intel (yes, those guys) showing off their “Ultimate MakerSpace,” at the company’s Intel Developer Forum in 2014. Both the dedicated and dabbler Makers have fueled the growth of companies that produce the materials and tools that people use to make (or fix) stuff. 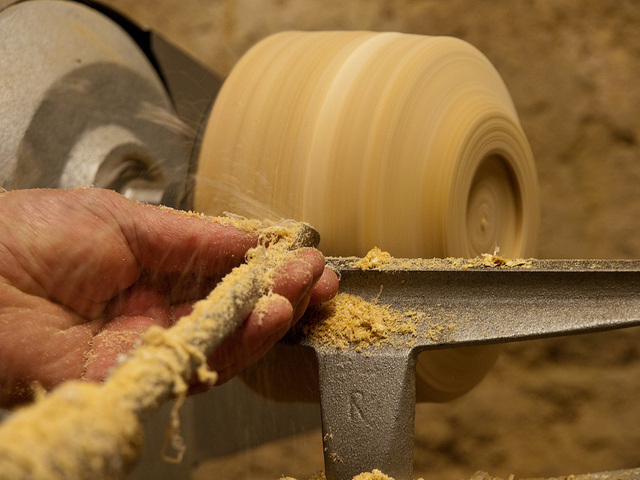 Sales of arts and crafts supplies and parts for all kinds of machines and electronic equipment are booming as well. People who get involved in Making often find something that they feel is worth exploring further, that gives them great pleasure. Some of them turn their new-found passion into a life-long hobby. Others become entrepreneurial and turn their creations into a business of their own. Besides distributing their creations to traditional brick-and-mortar stores or participating in venues like street fairs and festivals, many Makers sell their creations online to people all over the world by making their own websites or by using Craigslist, eBay, or Etsy to sell their own cool stuff. The connections just keep multiplying. 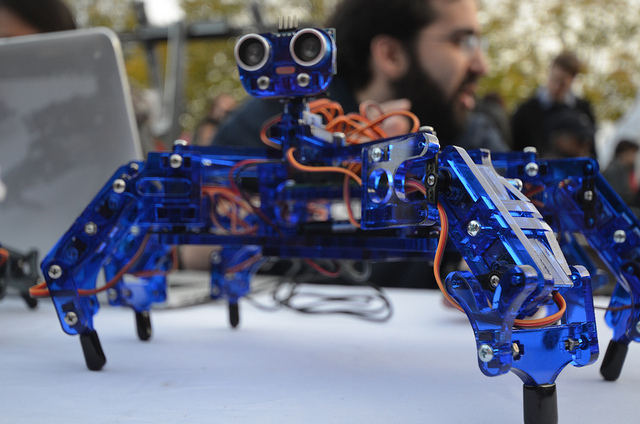 More than one observer of economic and business trends have commented on the Maker Movement. It has gotten wide and deep. The general consensus seems to be that it is a very good thing to encourage folks to ponder on problems and figure out how to make their own solutions rather than just going out and buying another doo-dad put together by someone else. After all, it is the people who make things who have the potential to change the world. My own feeling is that each of us carries a little spark of the Creative within us. It’s a good thing, I think, to go play with that. What all humanity says it wants. In the hearts of each of us.